My friend Lisa (Morris) Buckman emailed this picture of us that her nephew found. It was too good not to post. That is Lisa on the left and me on the right. I have no idea who that is poking their head around the side. Those are some awesome dresses. 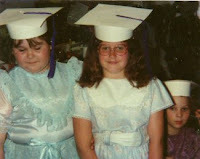 This was 3rd grade graduation and we had to look GOOD! oh my goodness!!! lookin good ladies!! i really needed something to brighten my day. thanks! !